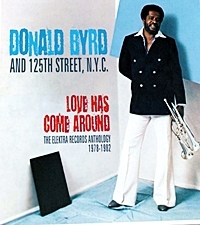 Trumpeter, composer and band leader Donald Byrd was firmly established as a legend by the time he joined Elektra. The material here is pulled from his four albums for the label and includes some of his biggest Jazz funk/soulful disco tracks. ‘Love Has Come Around’ has that classic fusion of jazz funk and disco, the boogie bass of ‘Loving You’ is infectious, the lush, breezy stepper ‘Your Love Is My Ecstasy’, ‘Close Your Eyes And Look Within’ and ‘So Much In Love’ are killer mid tempo efforts. The classic ‘Thank You For Funking Up My Life’ still sounds fresh while the emphatic, building ‘Everyday’ is a gem. So many great moments on this 31 track double CD set.